1939 was the year that a decade-long period of dust storms finally ceased ravaging the midwestern United States. 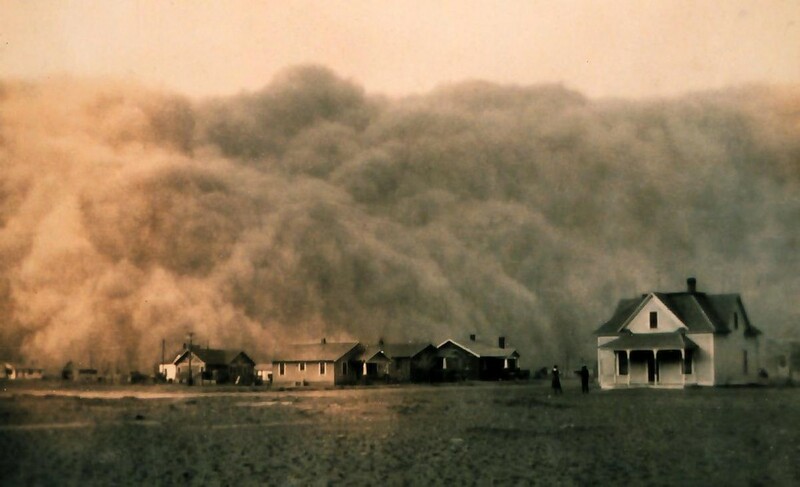 Once the dust had settled, Americans were able to look back at the disastrous decade of the 1930's, taking stock of the damage the Dust Bowl had caused, while considering how to ensure something like this never happened again. Prior to the 1870's, the area of the Great Plains was known as the "Great American Desert" due to its arid climate and land that was difficult to cultivate. But at the end of the 19th century, a coincidental (and impermanent) climate change began to change people's view of the area. Plentiful rain began to fall, beginning a period of wet weather that would last through the 1920's. European settlers flocked to the now-fertile Great Plains and the advent of mechanized agricultural equipment made cultivating large swaths of land easy and profitable. Because of the confluence of these events, settlers (and especially those trying to sell them land) came up with a dangerously inaccurate theory -- rain follows the plow. While some credited God with bringing rain for the hard working farmer, others used pseudo-scientific explanations that claimed various aspects of human agricultural activity actually increased moisture and seeded clouds with rain. Unfortunately the lush period of the late 19th and early 20th century in the Great Plains was nothing more than the results of climate fluctuations. Beginning in 1930, a series of massive droughts struck the Great Plains, which resulted in erosion of the topsoil. Progressively bigger land grants and agricultural operations greatly reduced the indigenous grass of the area, which would have been able to keep the soil anchored to the ground throughout this period of great droughts. But it had been replaced by acres and acres of crops, and when none grew due to the drought, midwesterners were faced with a lot of dry dirt, which turned to dust. The heavy winds of the great plains easily lifted up this unanchored dirt and carried it eastward. Throughout the decade, monumental dust storms roamed America. These dust storms would last days and oftentimes black out the sun. One particular storm dropped 12 million pounds of dust on Chicago, and continued on to ravage cities as far east as New York and Washington, D.C. The effect was so bad that in the winter of that 1934, red snow fell on New England. The droughts of the 1930's wreaked havoc on those living in the Great Plains. Crops wouldn't grow, leaving those who relied on farming for their income to look elsewhere for work. The dust storms themselves destroyed houses and even entire towns -- over 500,000 Americans became homeless due to the Dust Bowl. This desperation caused the greatest migration in U.S. history. By 1939, 3.5 million people left the Great Plains, with most of them moving westward in search of work and a place to live. Though they came from Oklahoma, Arkansas, Missouri, Iowa, Nebraska, Kansas, Texas, Colorado and New Mexico, these migrants who were forced to abandon their farms were known as "Okies" in the states and towns they immigrated to. Okies weren't just farmers -- as the Dust Bowl shattered entire towns and cities, teachers, lawyers and business owners were often forced to flee and look for work elsewhere. Nearly one third of all migrants during this period were white-collar professionals -- not only farmers were affected by this disaster. California was the most popular destination, as it didn't suffer the same environmental consequences as the Great Plains, and at the time was not nearly as populated as it is today. 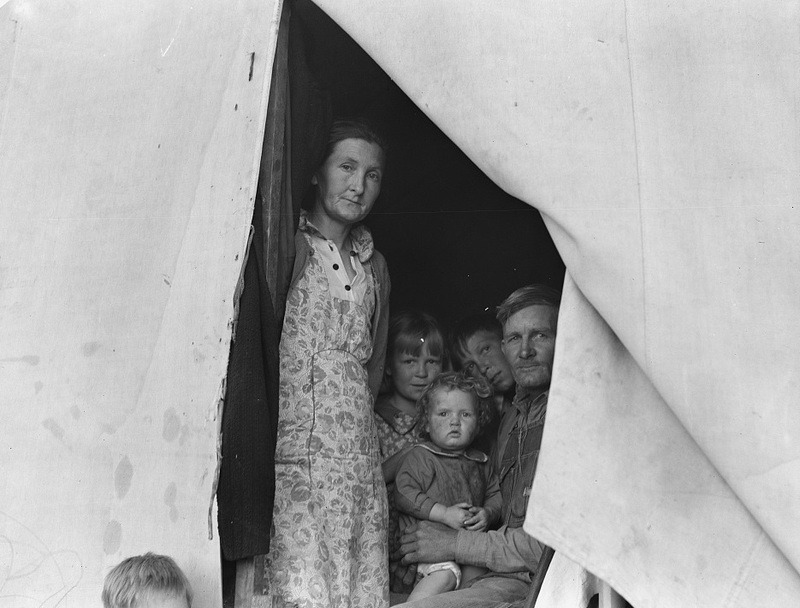 Although the California Gold Rush in the 19th century is remembered as the time when masses of people immigrated there, the Dust Bowl brought far more new residents to the state -- in a one year period, over 86,000 people immigrated to California. The government of the United States acted quickly to combat the ravaging effects of the drought, but the horse was already out of the barn -- there was no stopping the Dust Bowl once it had started. Despite this reality, President Roosevelt knew he had to act in some capacity, and hoped that his actions could at least shorten the Dust Bowl or prevent future episodes from occurring. He implemented programs to teach farmers soil conservation practices and educate them on sustainable agriculture. Farmers were paid a dollar per acre to adopt these new techniques. 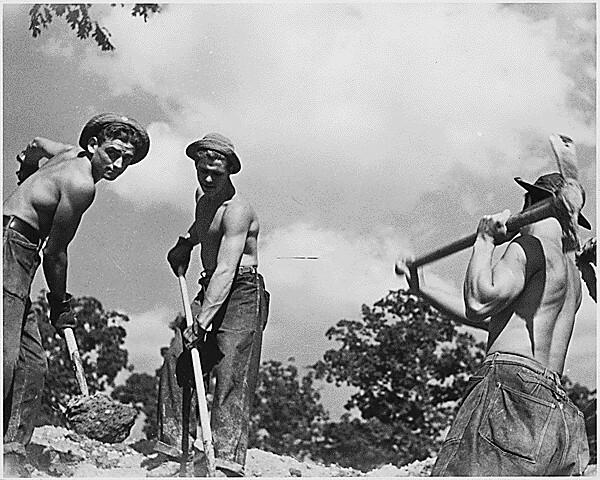 Perhaps most helpful was the Civilian Conservation Corps, which employed thousands of Americans. Roosevelt directed this group to plant over 200 million trees in the Great Plains to lessen the wind, hold water and keep the soil in place. By 1938, nearly five years of these Dust Bowl-reducing effort had paid off -- the amount of blowing soil was reduced by 65% from earlier years of the storms. While the dust was greatly reduced thanks to ramped up conservation efforts and sustainable farming practices, the drought was still in full effect in April of 1939. Although it seemed like the drought would never end to many, it finally did. In the fall of 1939, rain finally returned in significant amounts to many areas of the Great Plains, signaling the end of the Dust Bowl. But the damage remained. By 1939, many regions had lost over 75% of the topsoil to erosion. Areas hit hardest would never fully recover -- land value decreased by nearly 30% in highly eroded counties, and farmers stubbornly refused to switch to crops that were better suited to eroded soil. Some of the Okies returned to the Great Plains areas they originated from, but most stayed settled where they had found new homes. Were your ancestors affected by the Dust Bowl at all? Even if your family has been living in California for decades, it's possible that your roots are from the Great Plains. Start exploring your past today and make sure to tell us the stories you discover!